These Indonesian Sterling Silver Fan Earrings are hand crafted out of exceptional quality materials. 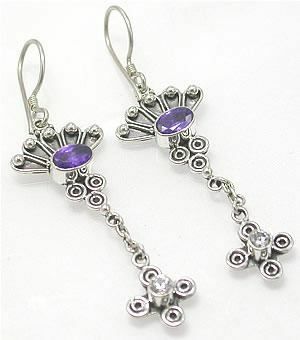 These unique earrings have a purple top jewel with a sterling silver fan detail and a dangling sterling silver chain with a crystal jewel. Keep extra cool with this matching Bali Fan Belly Button Ring.